Student activists join forces with organizations, youth groups, and each other to amplify the voice of their generation and fight for their beliefs. Zarina Iman ’18, emboldened by the protests in Ferguson, Missouri and repeated incidents of the police killing unarmed black men, decided to join The Union, a club dedicated to issues of race and social justice, commencing her involvement in activism. Iman is currently active in several different causes, ranging from religious equality to criminal justice reform. However, racial justice is her main focus because it’s a common thread throughout many social justice issues, she said. “[Racial justice] permeates a lot of different types of activism because it really affects conversations about women’s equality, it affects conversations about criminal justice reform, it affects conversations about violence and anti-gun violence,” Iman said. Iman, who is a student at the University of Pennsylvania, currently works with the Women’s March, as well as the Justice League NYC, and Youth Over Guns, an organization that she helped form, which is also partnered with the New Yorkers Against Gun Violence organization, she said. Joining The Union also helped Eric Ohakam (12) realize the importance of activism through his conversations about issues such as the wage gap and toxic masculinity with other students in the club, he said. “The conversations are the first part, they help lead into the rally, the actual physical stuff you’re going to do,” he said. Conversations inform the public about topics and make sure that the people involved know enough to participate and not be afraid that they’re going to say something incorrect or offensive, he said. Sofia Del Gatto (11) agrees that conversation is an essential element of activism, as it allows people to develop independent opinions about equality, as well as foster empathy and compassion among young people, she said. “If we grow up ignoring the problems our society faces, we grow up ignoring part of our world. That obviously gives us a limited mind because we can only see part of the world and we refuse to accept anything that’s outside of what we already knew,” she said. Outside of school, Del Gatto is most active in working to combat fascism and the Trump Presidency, she said. These topics permeate discussions she has with her friends and with the Feminist Students Association (FSA), a club which she leads, she said. Del Gatto believes that attending protests and rallies is the most effective component of her activism. However, she thinks that one must be consistent in their pursuits in order to make change, she said. “Even if you’re a small group of people, if you’re loud and there, people are going to pay attention to you,” she said. Natalie Sweet (10) believes that protests are useful vehicles for organizations to share their messages, but people must maintain their energy after marches for organizations to succeed in their goals, she said. “Activism [where people only go to marches] is something that our generation is getting really caught up in, but I think it’s really important to recognize the broader impacts that these kinds of movements —if you keep pushing them forward— can have,” Sweet said. Sweet integrates her environmental activism into the school through the Take Back the Tap initiative, a movement which aims to decrease usage of disposable plastic water bottles. 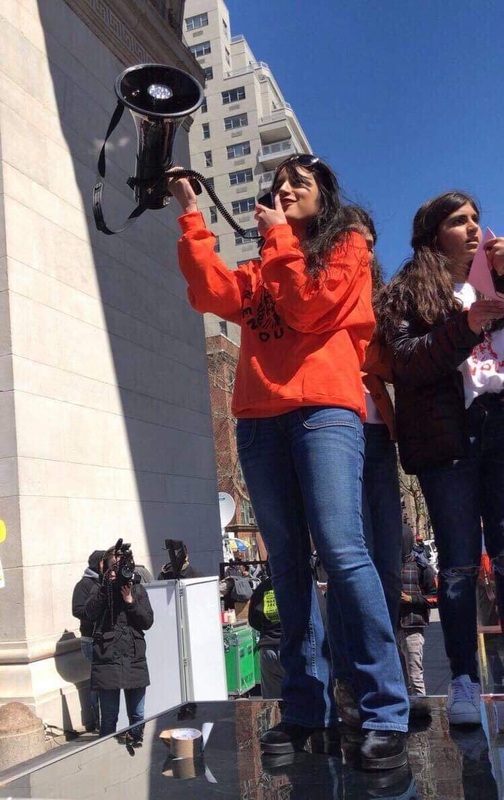 She is also the public relations director for Zero Hour NYC, a chapter of the nationwide student-run organization which works to combat climate change. Sweet is helping Zero Hour NYC to plan a festival this summer which will promote several environmental protection and social justice organizations, she said. Berg is a leader of Green HM, the school’s environmental activism club, which has recently been working to minimize the school’s carbon emissions in the cafeteria and new student cafe. He has always been interested in fighting for the well-being of the earth, but was motivated by the results of the 2016 presidential election, he said. “I realized that there’s a lot of hate and desire to regress politically in the United States, and somebody needs to do something. I don’t want to sit idly by while others fight the fight that I have the resources to participate in,” he said. Ohakam sometimes feels disempowered by politics since, like the majority of high school students, he is too young to vote. However, he uses his role as the co-Vice President of The Union to immerse himself in politics and energize other students to engage in activism, he said. Sweet also believes that her age can be a hindrance to her activism, as a common perception is that young people view their activism as insincere, she said. “I think something really important for the younger generations to remember is that we’re going to be the people, especially with climate change, that are left here to suffer the effects of a world that somebody else created,” she said.